Alpinestars GP Plus V2 Leather Sports Jacket. A superbly styled sport riding garment with premium leather and extensive stretch paneling, the GP Plus R V2 Jacket is brimming with protective and performance features. A multi-panel lining adds to the formidable comfort benefits of this jacket which can be attached to Alpinestars riding pants. 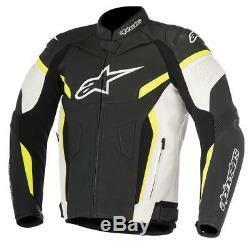 Alpinestars GP Plus V2 Leather Sports Jacket Key Features. Highly durable and technical premium 1.3 leather, multi-panel construction for superb abrasion resistance, with reinforced stitching for optimum tear resistance in the event of an impact. Alpinestars race-derived, CE-approved removable internal shoulder and elbow protectors. Newly developed shoulder protection features over-molded advanced TPU guard layered under the outer fabric for optimized levels of protection and comfort. Chest and back pad compartments with PE padding (Alpinestars Nucleon chest and back protection inserts available as accessory upgrade). Size-adjustable snap-button system to integrate the Level 2 CE certified Alpinestars Nucleon Back protector. Extensive, advanced poly stretch inserts on chest, underarm and rear shoulder for an excellent fit optimized for all styles of riding and helps keep jacket sleeves positioned close to rider's body. Extensive accordion leather stretch panels above elbow areas allow greater range of movement and helps reduce arm fatigue. Perforated padded panels integrated into main shell and sleeves for improved fit. Pre-curved sleeve construction helps reduce riding fatigue and prevent material bunching. Combination snap button and zipper wrist closures for secure and customized fit. Velcro and D-ring waist adjustments ensure highly customized fit and secures jacket in position. Ventilation inlets on shoulders are zippered to allow efficient regulation of interior temperature. Soft 3D mesh collar construction plus 3D mesh cuff edging for improved comfort and breathability. Mesh liner construction for improved breathability, comfort and ventilation. External, large-opening front hand pockets are zippered for peace-of-mind closure. The item "Alpinestars GP Plus V2 Motorcycle Leather Sports Jacket Black / White / Fluo" is in sale since Thursday, January 24, 2019. This item is in the category "Vehicle Parts & Accessories\Clothing, Helmets & Protection\Motorcycle Clothing\Jackets". The seller is "megamotorcyclestore" and is located in swindon, Wiltshire. This item can be shipped to all countries in Europe.